Create a lasting impression with our beautiful Custom Leather Swing Tags. Perfect for adding an original finishing touch to gifts or your own fashion line, our leather swing tags are made from Italian Nappa leather in either a smooth or textured finish, or from a faux leather alternative. Stand out and choose leather labels for your crafty projects. Swing tags made and printed to order in 4 different sizes. Fine Italian Nappa 3" x 2" x 0.08"
For all of the designers and fashion students out there, our beautiful hand finished Custom Leather Swing Tags will give your collections the perfect finishing touch. They add a luxurious finishing touch and are available in small or large packs. Made from beautiful Italian Nappa leather, choose to personalize your swing tags with a design, photos or text to create a stylish and lasting impression. Add your name and number to fashion samples so buyers know just how to contact you. Stylish and practical...our favorite kind of product. You can combine them with our other helpful products for handmade items such as swing tag cards and fabric labels for handmade items all in full color. Great quality and excellent service, the results are beautiful and I am receiving compliments from everyone!!!! This was a perfect addition to a wedding gift! It was personal and really added something special! This product really allows me to make my mark on gifts. No matter the event or occasion. I have ordered from here before and I will continue to do so. XS - 1.69" x 2.16"
S - 2.16" x 3.34"
M - 2.16" x 4.13"
L - 2.16" x 5.9"
If you are a crafty person who loves to customize gifts, then our new Custom Leather Swing Tags are for you. 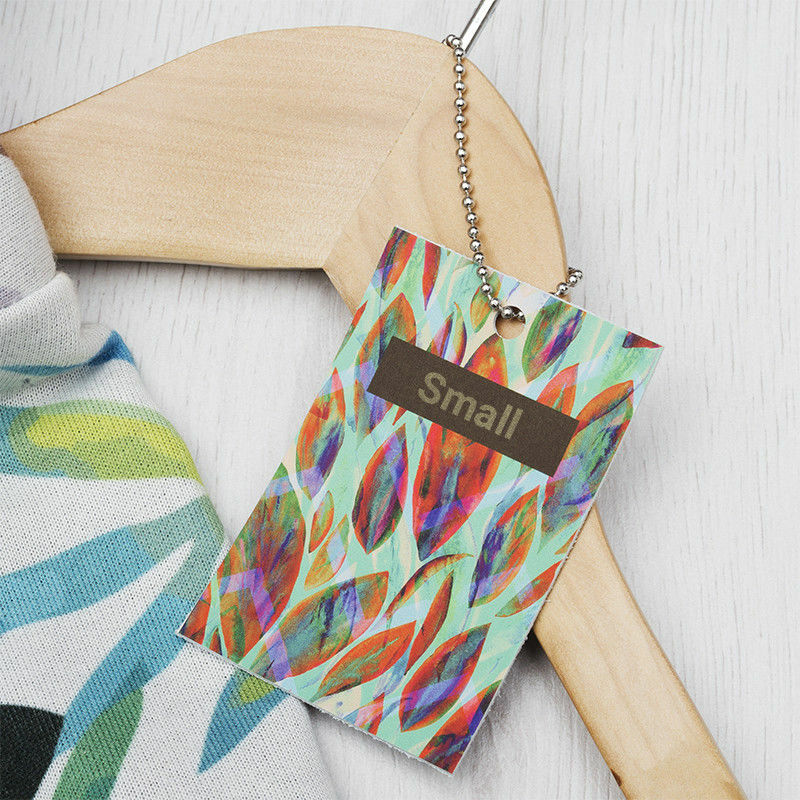 Perfect for craft lovers, these unique leather swing tags are printed in full color on beautiful Italian leather to display your designs and message. Once you have wrapped up your friend's present, simply attach the customized swing tag to add a final touch of love. Fitted with a metal chain for easy attachment, create a design from the heart to show your friends and family just how much you care. These personalized swing tags really do make the perfect finishing touch. Our Custom Leather Swing Tags are available in a pack of 10, so you can stock up for future projects or personalize a few special ones. Note: Due to the natural creamy base tone of the leather, colors can take on a slightly creamier hue. For example, white colors will appear slightly creamy with a slightly yellow finish. We source the finest Italian Nappa leather, so each individual leather tag is totally unique, featuring different variations of the natural grain. We print your custom swing tag designs onto the sheet of leather and manually cut the amount you order. The print is long-lasting, and colors have a beautiful, finish. You can design each individual tag so they're all different, or choose to print all tags with the same design. Because it's a natural product, the face will have visible grain and pockmarks. Over time, they'll develop a subtle cracked patina, and all of this simply adds to the authentic charm of leather. Perfect for craft and DIY lovers, these sweetly personalized leather labels are ideal for gift wrapping. Once you've finished wrapping, simply attach to a bow for a final touch of love. If you make homemade wine as a hobby, attach a leather tag around the nape of the bottle featuring a little description about the care and love that went into each bottle. Fitted with a metal chain or ribbon for easy attachment, create a design from the heart to show your friends and family just how much you care. You can use these as fashion swing tags, ideal for showcasing your clothing brand logo and garment details. Choose from XS, S, M or L and put that professional touch that customers can't help but remember. Not just any old label you discard, these luxury swing tags can double as a business card for your fashion line, incentivising people to keep them for future reference. Because each leather tag can be customized with a different print, you can include special offers, limited edition prices or different sizes into your design.